Hello, Hello. My name is Kadie and I blog over at Seven Alive all Livin' in a Double Wide. I am really excited to be here today. Jenny is such a fun blogging buddy. It has been a true joy to get to know over the last couple of months. I love the layered look. I wear cardigans or double t-shirts often. It is starting to warm up and in the south that means no more layering. It is to hot to wear anything as thick as a cardigan. I was thinking that if I had a cardigan that was as thin as a t-shirt I might still be able to wear it in the summer. Enter the huge bag of clothing my MIL gave me forever ago. It is the same bag that this sweater dress came from. 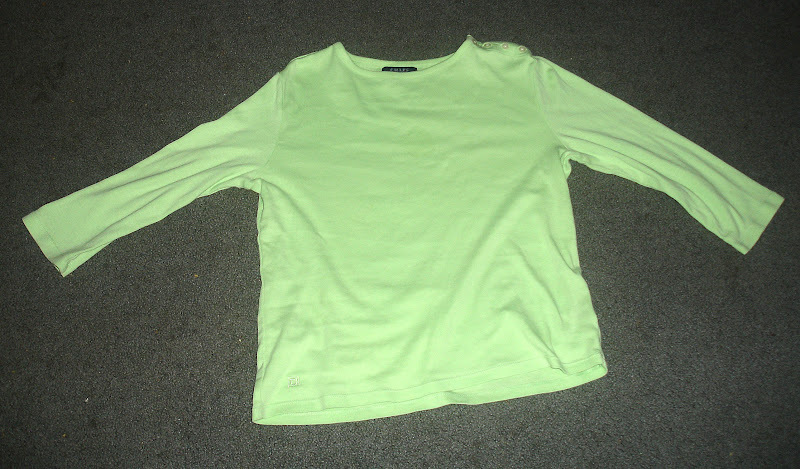 I took a t-shirt that I like the color of and fit me okay. It is a little shorter than I like for a t-shirt. I love working with knit fabrics for up-cycles. They are great because they don't fray. Here is what I did if you would like to make one for yourself. 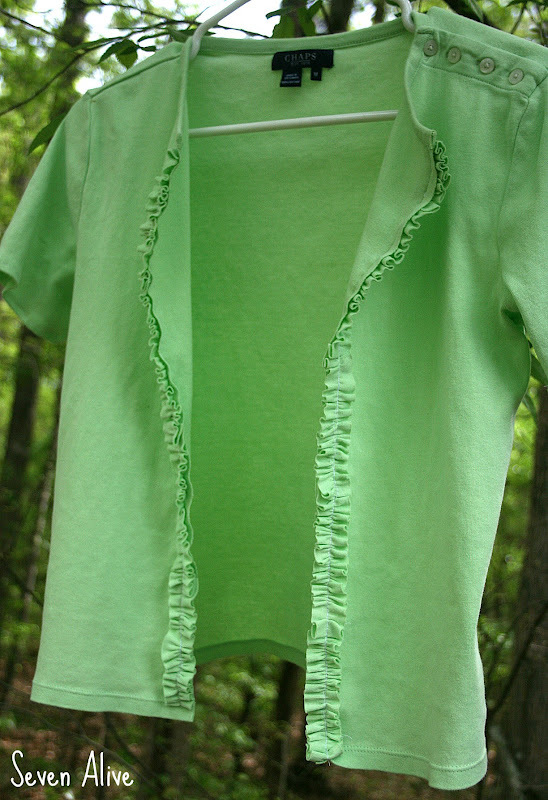 Cut the shirt up the middle with scissors. Then try the shirt on and with pins mark how short you want the sleeves. 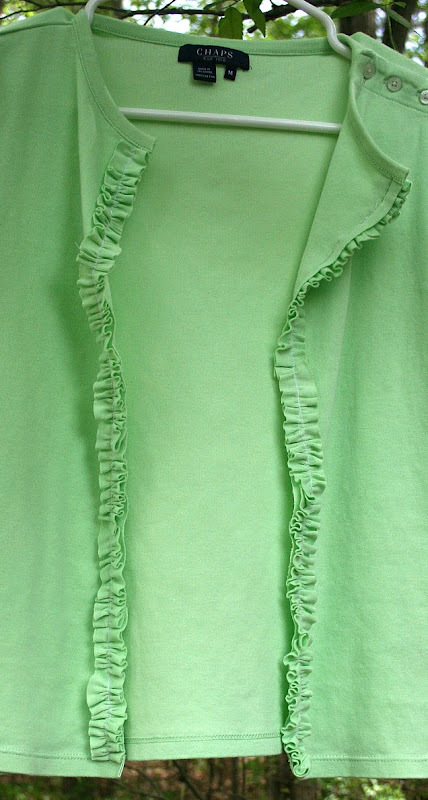 The material from the sleeves makes the ruffles so you want to chose a shirt that you want to shorten the sleeves. Next cut the sleeve material into 1 inch strips. You can use the tutorial here for making straight cuts if you need it. 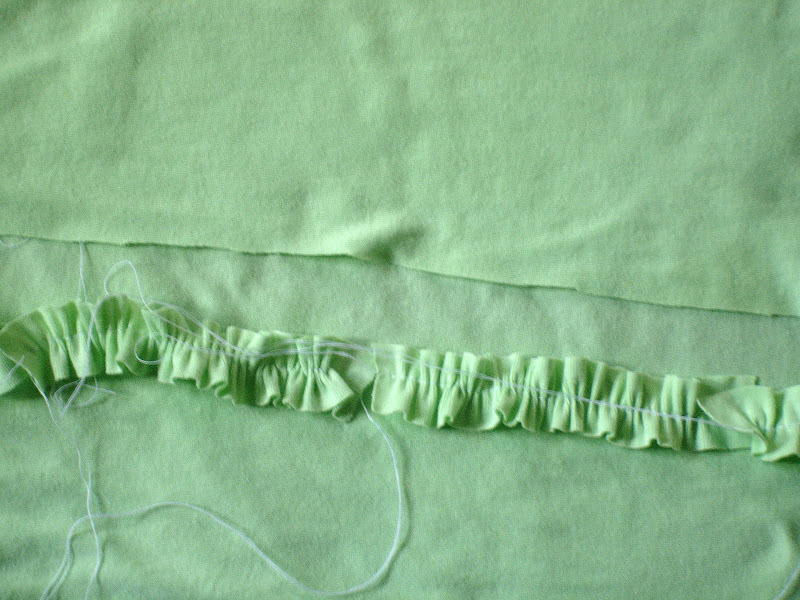 After you have your 1 inch strips you are going to ruffle them. 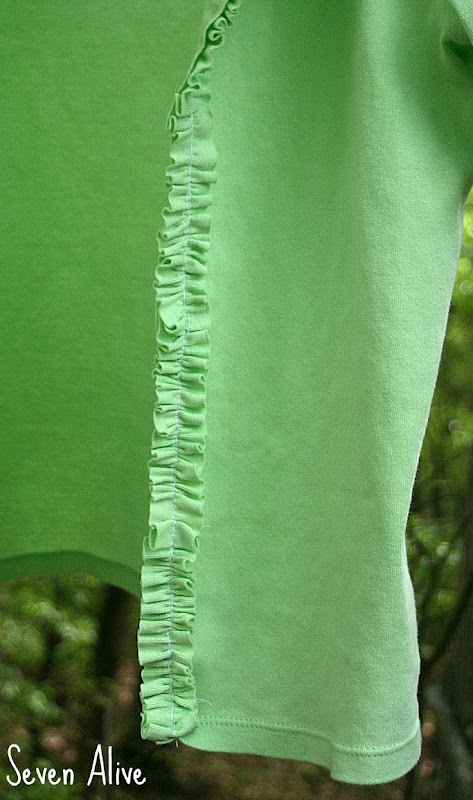 Ruffling strips is super easy. 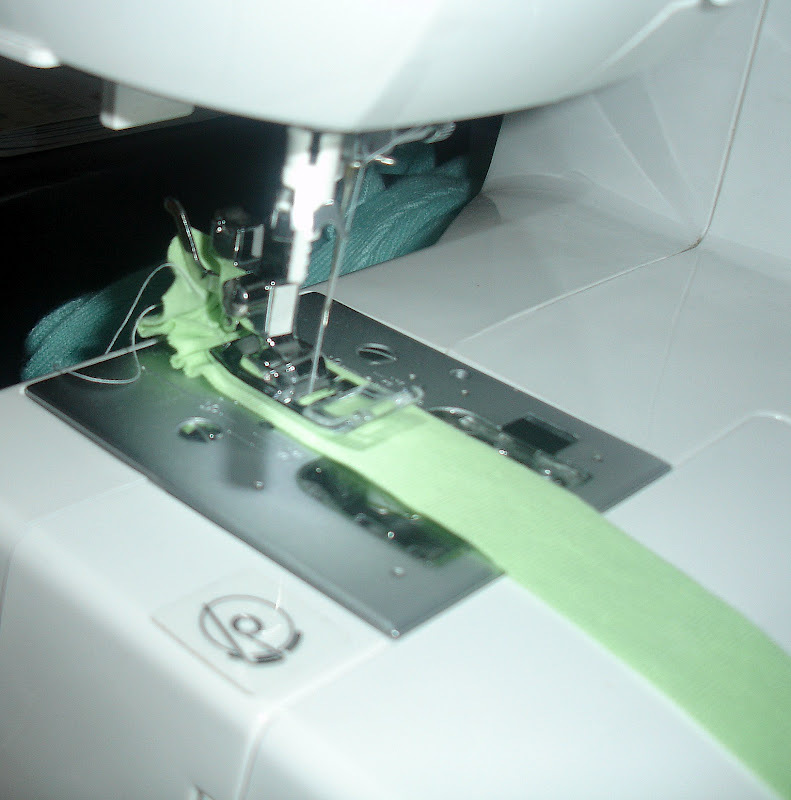 On your sewing machine make your stitch length as long as it will go. Then set your tension as tight as it will go. Make sure you leave very long strings at both ends of the strip. Place your needle right in the middle of the strip and go. It will magically ruffle up behind the needle. 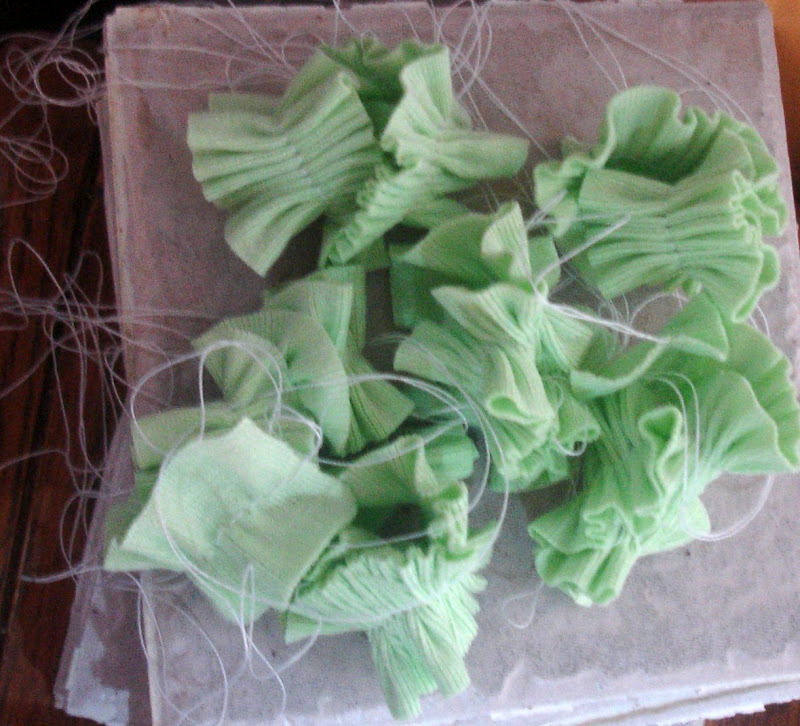 Ruffle all the strips you cut from the sleeve material. Lovely piles of ruffles with VERY long strings. 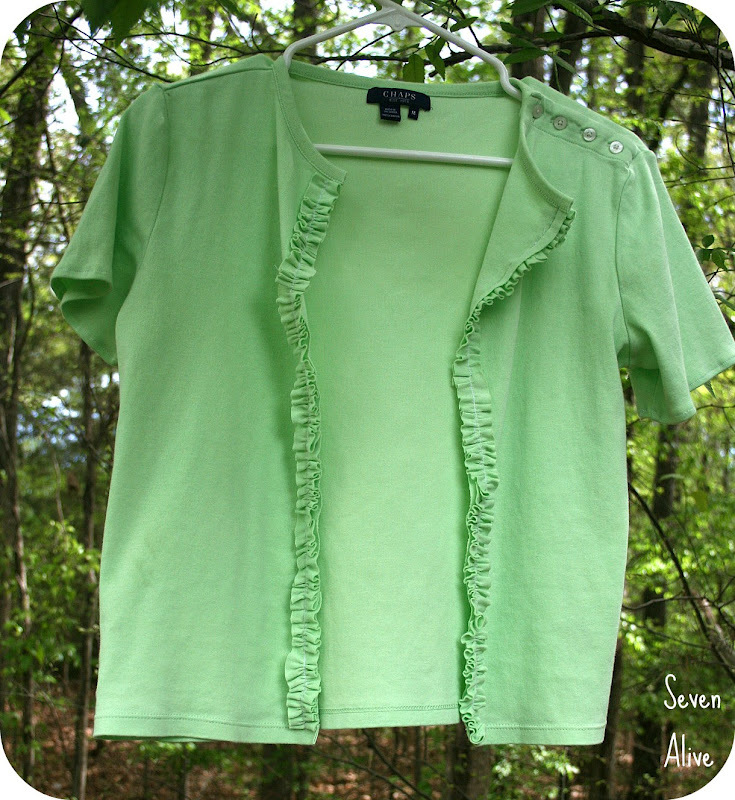 Straighten out the ruffles to look the way you want them to. Take care not to break any of the thread. Pin the ruffles on the shirt about half an inch from the cut. Sew down the center of the ruffles. Cut off all the strings when you are done. That's it. Your done. And just in case you are wondering yes, you do get funny looks when you hang a shirt in a tree and start taking photos of it. Oh well, at least it was just my in-laws. They already know I'm crazy. Thanks so much for having me today Jenny. It was a blast. Isn't that pretty!!! I can think of a ton of shirts that I could update like that! Be sure to visit Kadie's blog, say hello and check out some of her other great projects. I love this idea, because I also enjoy layering. A short-sleeve version would be great, and I already love saying, "thanks, I made it." ;) great share, Kadie!! This is cute and easy - what could be better than that. I love how the ruffle really adds some nice flare.